With over a decade of experience, Lifebroker is an expert in life insurance and income protection. 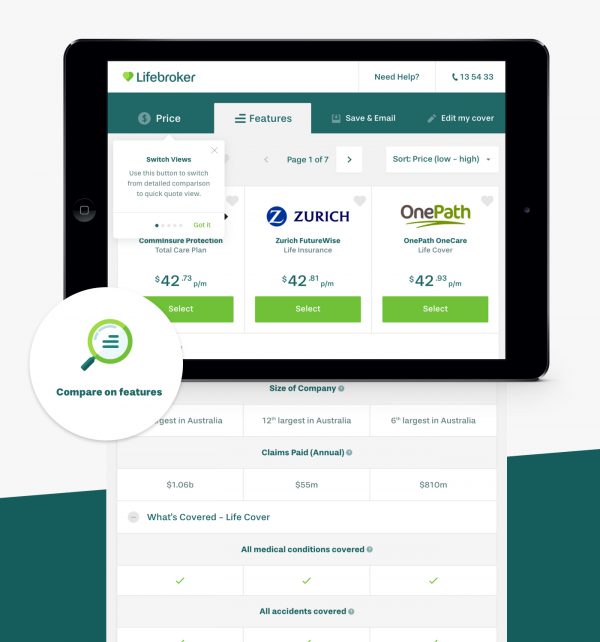 Lifebroker helps you easily compare different insurance products and prices, so you can get a fair and balanced, comprehensive assessment of what’s available and what might best meet your individual needs. Lifebroker engaged us to improve customer UX, incorporating the refreshed brand elements. 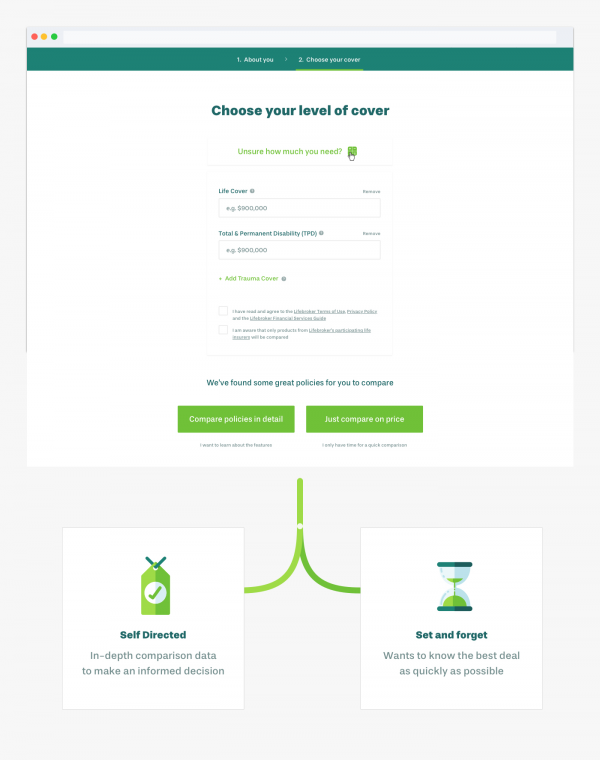 The site had to reflect the warmer and more engaging tone of the new brand, integrate with the stand-alone insurance comparison tool we launched a few months prior, and ensure customers understood the features and details of different life insurance cover options. After thorough and considered research of the self-directed life insurance market and crafting detailed user journeys, we built a website that harmoniously balanced lead generation against industry education and product information. The site is fully responsive, with customer-centric features and intuitive pathways leading users through the site’s content and tools. Delivering a significant uptick in leads, the site performs exceptionally for users and Lifebroker alike. 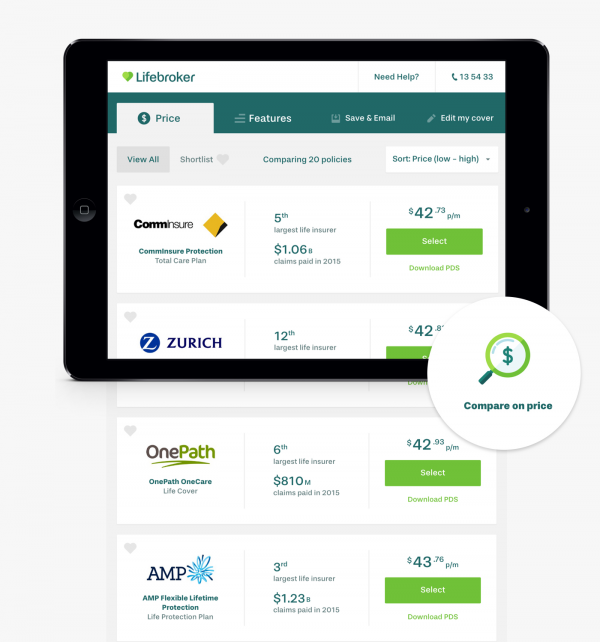 Lifebroker wanted to propel its brand to the next level and become Australia’s leading life insurance and income protection comparator website. The goal: to share their decade of experience with everyday Australians and empower them to make better decisions when it comes to purchasing insurance. 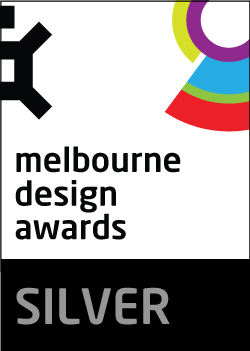 The website needed to reflect the new branding and be focused on conversion optimisation. The new “double-heart” motif and illustrative elements provide a more engaging, light-hearted approach to a serious topic. 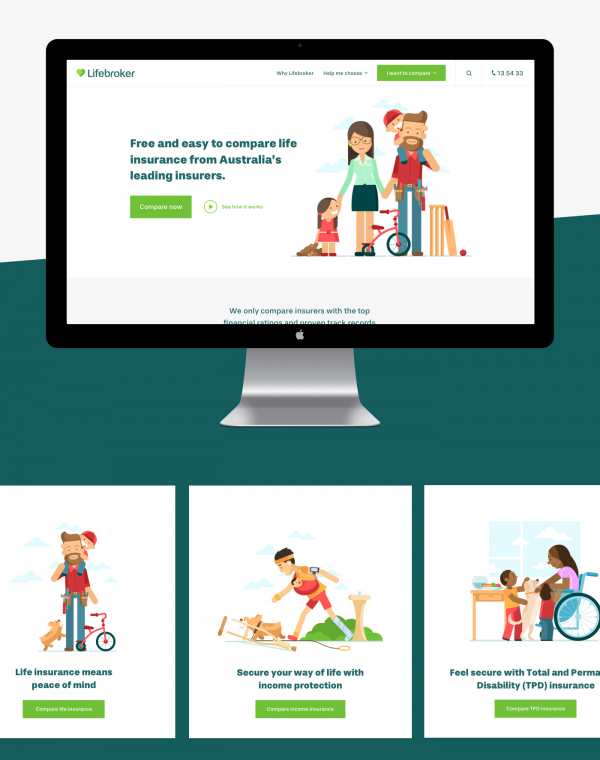 Lifebroker also wanted a content-rich website that positioned the brand as a thought leader in the insurance industry and to become the go-to website for Australians looking for trusted insurance information. We continued our long-term partnership with Lifebroker when they approached us to redesign the website. We agreed that the best way to achieve their goals was to craft an outstanding user experience that generated leads by simplifying the process of comparing across a variety of life insurance options. Our biggest challenge on this project was developing a website that balanced simple, interactive elements like the site’s insurance comparison tool against rich, informative content. We designed a product that satisfied a range of user needs whilst also boosting the business’s credibility and visibility, and generating business leads. The website needed to be ‘smart’ and tailor content depending on what the user was seeking. Lifebroker wanted the website to be more than just a comparison tool — it needed to offer up content that helped build confidence in the Lifebroker brand at every stage of the user lifecycle and maximise the chance of conversion. In speaking with stakeholders, it became clear early on that for this website to be successful, it had to be structured in a way that not only prompted an intuitive understanding of Lifebroker’s product offerings (complete with clear calls to action), but also communicated the business’s credibility and accessibility. For this reason, we split the new Lifebroker website into two parts: an educational section with plenty of detailed, SEO-friendly content, and a conversion-focused section with product overviews and quick pathways to core features like on-site assistance, calculators, and the all-important insurance comparison tool. 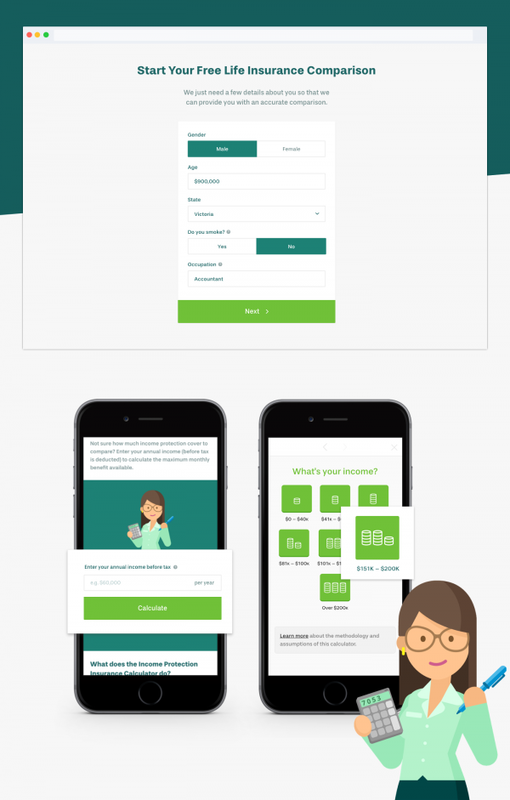 This approach meant we were able to satisfy those users who arrived at Lifebroker looking for an information hub, and those expecting a quick, easy, and action-oriented experience. In both cases, users can now move through the site with ease. We also applied our “show and tell” philosophy to try and mitigate an unfortunate truth about the insurance industry: insurance, and especially life insurance, is a topic that tends to create discomfort and unease. Conversational copy coupled with vibrant, playful illustrations softened the product offering whilst communicating the company’s appeal and approachability. Strategy and conversion optimisation was at the heart of this project, and we focused heavily on developing data-driven audience personas that informed the UX and design of the website. We identified two key personas: self-directed, and set and forget; the former was after more in-depth comparison data to make an informed decision, whereas the latter simply wanted to know the best deal. We incorporated custom, group-specific pathways throughout the website: users can now choose between receiving a ‘Quick Quote’ or an in-depth review of the available features and benefits of each product. Conversion-optimised pages: We placed focus on optimising product pages for lead conversion. Product page designs are reminiscent of stand-alone landing pages; incorporating a rich narrative detailing the insurance product and providing users with trust marks, encouraging them to move through to the comparison tool. Hosting infrastructure: We architected the site on a configuration able to scale to handle peaks in traffic. Being a user-centric site, this provides sticky-sessions to assign a single server to a user. All assets are stored on a cloud server directly accessible via the CDN; this offers better caching and site speed. Algolia search experience: We replaced Google Custom Search with Algolia so users could surface content at lightning-quick speeds. This required close collaboration with Lifebroker to customise search logic to balance the return of relevant content against major user pathways. Behind the scenes, a comprehensive digital launch strategy including integration with Google Analytics, Google Webmaster Tools, custom event and goal tracking, and search engine optimisation allowed for Lifebroker to be able to gain deeper insights into how the the website was performing to inform ongoing digital marketing efforts. In the three months following the site’s launch, statistics supported our user-centred design strategy: we observed increases in pages/session (+84.3%), average session duration (+29.2%), and a decrease in bounce rate (-28.5%) over the previous year. Retiring Lifebroker’s mobile website in favour of a fully responsive site increased mobile traffic volume (which accounts for approximately 20% of all traffic), and created a more complete, engaging experience for mobile users. After arriving on the site, mobile users are now spending more time across more pages (+101.8% pages/session, +82.7% average session duration). This increase engagement goes hand-in-hand with an increase in leads (+98%), lifting the company’s conversion rate over 300% and fulfilling the task of integrating Lifebroker’s insurance comparison tool seamlessly with the rest of the site, encouraging users to contact Lifebroker for more information. Standard privacy procedure was followed on all contact forms and other areas of the website where user data was collected. All management of user data complies with Lifebroker's strict internal compliance requirements. Regular penetration testing is conducted to ensure the site and server are secure. The website and hosting pass this testing with no significant issues identified. Fintech is radically changing how we live as society and how we do business professionally. We're looking for great apps and sites that are disrupting sectors such as mobile payments, money transfers, loans, fundraising, financial management.